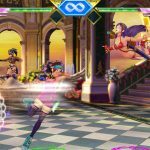 SNK Corp.’s SNK Heroines Tag Team Frenzy for Nintendo Co. Ltd.’s Nintendo Switch bouts a solid fighting framework for new and veteran users that pits trademark SNK characters in fast, frenetic fights. In SNK Heroines: Tag Team Frenzy, Kukri, the mysterious sand fighter from The King of Fighters XIV, has turned into a voyeuristic pervert who wants to collect fighters and turn them into sand sculptures. The unlikely villain is comedic gold as he blissfully yearns to merge his pocket dimension to the real world by absorbing fear and despair. The combatants themselves are fully aware of Kukri and his creepy behavior, with most lamenting their skimpy costumes in the alternate universe. The combat system includes Weak Attack, Strong Attack, Special Attack, Throw, Guard and Dream Finish functions. No crouch functions, including attacks, are included. Players choose two characters to take the role of Attacker and Supporter. Both share the same Life Gauge and can be switched with the press of the trigger. In front of the Life Gauge is the Spirit Gauge which constantly replenishes and is currency used to perform special moves and Dream Finishes. As the Life Gauge decreases, the max Spirit Gauge level increases proportionately. Most specials require one Spirit Gauge bar while the Dream Finish requires four bars. When the Life Gauge is low and turns red, the opponent must perform a Dream Finish to win the match. 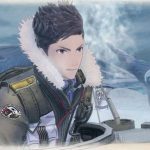 The Attacker and Supporter have separate Spirit Gauges and Supporter’s Spirit Gauge will increase faster as they wait to be switched to the Attacker role. To randomize events, Support Items and Attack Items will appear at certain conditions to aid each fighter. In addition, EX Items increase Special Moves power and SP Items activate abilities specific to the Supporter. The combat system is an interesting balance that forces users to utilize more Weak and Strong Attacks and save their Special Moves and Dream Finishes due to their use of the Spirit Gauge. The result is an unexpectedly complex system of strategy for fight veterans who will have to weigh the cost of each Special Move in order to retain enough bars to execute a Dream Finish and end the match. The game mechanics are fast and fluid, as Weak and Strong Attacks combined with Special Moves and Dream Finishes can create deadly juggle combos. Evasion and reversal moves are necessary to avoid being cornered, and Support Items and Attack Items are a must to stop more offensive players. The graphics engine is 30 frames-per-second for the Nintendo Switch SKU, though it can fluctuate to 60 frames-per-second at different points in the match. The frame rate discrepancy fortunately doesn’t subdue the tight controls on either the Joy-Con Controllers or the Pro Controller, but could dismay fight purists who demand a solid frame rate. The game shines in how each character is carefully aligned to their storied personas in SNK history. All fighters have witty, sharp, and unique dialogue, and each character’s personal ending includes many callbacks to other beloved characters from SNK fighting franchises. While the female Terry Bogard is a great twist to the iconic Fatal Fury fighter, the main highlight is Kukri, a final boss who is as blissfully dramatic as he is shameless. Each user can customize all 14 fighters with points earned from each battle. From cat paws to Hein’s glasses from KOF XIV, there are a ton of insane combinations for each outfit or accessory. SNK Heroines Tag Team Frenzy is a solid bout that pits a fierce roster of women in an easy-to-learn yet complex fighting title. While the basic controls relay a low barrier-to-entry to casual users, fighting veterans will find a lot more depth beneath the glossy surface.